"So it's roughly 4,000 feet of elevation gain... which means it will take us about three hours,” I say, calculating a quick series of numbers in my head. “We could do it at sunrise…"
The end of my sentence dangles, like a ripe tomato hanging off the vine on a hot summer day. Jon grins at me. I say what we’re both thinking. "Well, the idea is out there—now we have to do it." It’s the last day of July, and Jon and I are currently driving across Idaho, nearing the border of Montana. Willing my increasingly weak cell signal to work, I manage to pull up the weather forecast on my phone. "It looks clear—and not even cold. It shouldn't get below 55 degrees." The mountain we’re planning to climb is called Trapper Peak, a remote and (according to the internet) sparsely visited spot in the Bitterroot Mountains. 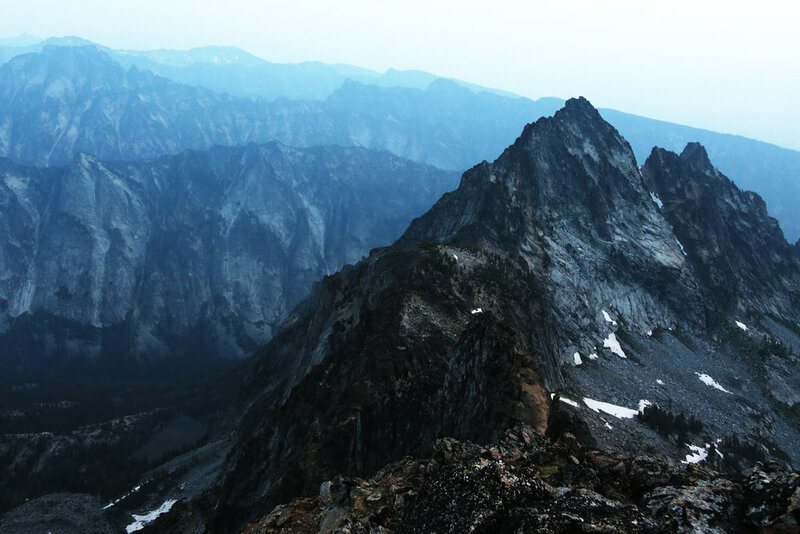 After reviewing the entries on Summit Post, I read about the highest point in Montana, Granite Peak, widely considered to be one of the most difficult of the 50 state high peaks. In fact, it was the last of the American high peaks to be climbed (including Denali). When we pull into the campground in the late afternoon, our minds are made up. We're going to start climbing Trapper Peak around 3am. That means we'll have to wake up around 1am to pack up camp, make coffee, and drive to the trailhead. Another alpine start. On the summit of Mt. McLoughlin as the sun rises on July 25, 2018. Our last pre-sunrise climb was in southern Oregon. We hauled the tent, sleeping bags, food, and supplies most of the way up Mt. McLoughlin, set up camp, and then woke up at 4am to climb the last 1,200 feet in time to watch the sunrise from the summit. An intrinsic and complex set of emotions accompanies every summit experience. But I always find the sunrise summits the most rewarding. It requires mental fortitude: to sleep for just a few short hours, to wake up many in the middle of the night, and to face the small degree of fear that comes with climbing steep terrain by only the light of a headlamp. Taking in the view from the summit of Mt. McLoughlin. On the summit of Mt. McLoughlin, we stood at an elevation of 9,495. This morning, as we step out of the car and lace up our mountaineering boots, we're at an elevation of 6,382. Soon, we’ll be just over 10,000 feet. A large wooden sign post marks the trailhead, displaying maps, notices, and warnings. As we walk past it, Jon makes a casual remark about being in bear country. Humans make all kinds of noises to detract bears—bells, whistling, singing, hollering, or simply talking loudly. This morning, in the dense darkness, we opt for conversation, exchanging stories from our childhoods. Jon tells me (as he often does during long hikes) about his varied experiences in the Boy Scouts. We talk about our families and our pets. We relive memories from college. If there are any bears around, they aren’t interested in our stories. Two and a half hours later, we're making the final approach to the summit, scrambling through a large, steep boulder field. Today marks two special occasions: my first summit in Montana, and my brother's birthday. I take out my phone and record a short video message for Austin who is currently in Colorado. I like to think he’s also enjoying epic views of big mountains right now. As we begin the descent, I feel light and inspired. For the past two years, I’ve dedicated a large chunk of time and energy to planning climbs in California, the Cascades, and South America. But Montana, the mountainous country, has stolen my attention. I can’t wait to come back here. Jon on the summit of Trapper Peak.